White Zombie is a 1932 horror movie. It was directed and produced by brothers Victor and Edward Halperin. The movie's zombie theme was based on Kenneth Webb's Broadway play Zombie. Reviews were mixed. A sequel was made in 1936 called Revolt of the Zombies. 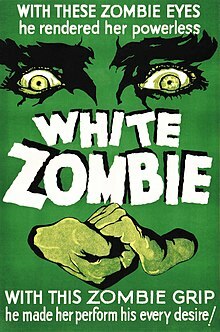 White Zombie is the first zombie movie. It was one of the few American horror movies to be approved by the Nazis. Madeleine and Neil are going to be married at Beaumont's house in Haiti. Beaumont secretly loves Madeleine. He wants to find a way to get Madeleine to love him. He goes to a zombie master named Murder Legendre. Murder tells Beaumont to give Madeleine a certain potion. He does. She becomes lifeless. All think her dead. She is placed in a cemetery vault. In the night, Murder and Beaumont carry her off to Murder's castle on the coast. Murder has fallen in love with her, too. He gets rid of Beaumont by turning him into a zombie. Neil and his friend Dr. Bruner set off to save Madeleine. Murder falls from a cliff during a fight with Neil. His power over Madeleine is broken. She returns to life.